WELCOME to Blackcomb Greens, located on the first fairway of the Chateau Whistler Golf Course just across from the 'home run' ski in trail. Upon entering the home, the large mudroom has great space for hanging gear and sports equipment. It has a spacious master bedroom with a queen bed and ensuite bathroom plus a second bedroom with a single over double bunk bed off the hall. A second full bathroom is adjacent. There is a washer/dryer off the hallway so you can pack light. Towards the back of the home, the open living area features a wood burning fireplace to cozy up next to after your daily adventures and a pull out sofa bed so you can comfortably accommodate up to 6 people. The full kitchen will have all you need for self catering with a large dining area and a large patio complete with BBQ for those sunny summer evenings. The golf course views are amazing in both summer and winter. Free WiFi, cable and local calls included. 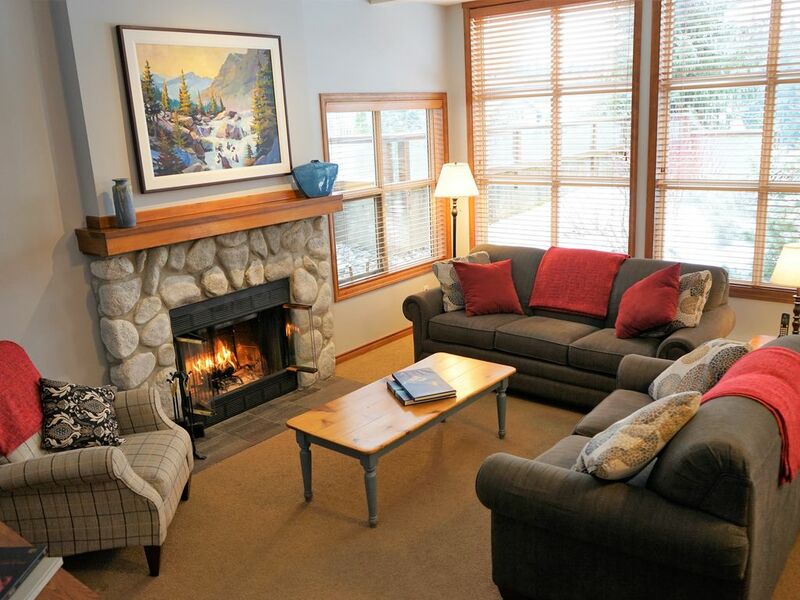 This is a beautiful place to call home while vacationing in Whistler! Blackcomb Green offers an outdoor common area hot tub and a free parking stall. Note: Parking includes one free parking stall in secure underground. Any additional cars will need to be parked off site in paid lots. This place was large and spotlessly clean. Great, scenic location outside of the village noise. This is the end unit right next to the unloading parking area and the master bedroom window faces it so we ended up with vehicles backed in running their engines outside our window. There is also a unit above and we could hear them thumping around into the evening. Nothing too bad but worth noting if you have sound issues. This condo is clean and fairly spacious for its type. The living room is quite a bit larger than the average condo, for example. It was a quick shuttle ride to the ski hill and there's the option to ski down a trail across the street, which is a fun alternative to the shuttle. This unit is a bit loud and not for the light sleeper. It is close to the loading area and we were awakened each night by loud talkers unloading things late at night. Other than that, it's a good spot and a decent price. Thanks for taking the time provide your feedback, Brad. I'm sorry to hear that you were bothered by noise during your stay. This complex is usually one of the most peaceful and quiet locations and we've never had a complaint from previous guests. As well, there is not usually any loading or unloading going on there at night, so you must have had a bit of bad luck with that timing. For future stays, there is a bylaw in Whistler stating that there must not be any amplified speech past 10 pm and if you are having difficulties with noisy neighbours, you can always feel free to call us and we can contact the security for that complex. We hope this didn't spoil your stay and look forward to hosting you again! What a lovely review - see you next time. I used this as my base for a business trip. It was nice but it was not fantastic. There were a few maintenance things that could have been taken care of beforehand; missing towel rack and run on toilet. The check-out times are terrible. 10 am and, after a number of requests, this was extended to 11am. Not good as my business meetings started at 7:30am and ended at 11am so I had to spend my last morning waking up really early, putting the trash out, putting towels in the tub, resetting thermostats, cleaning out the fridge, turning lights off and running the dishwasher so as to accommodate busy cleaners. I will consider going back to a hotel stay that does not expect pre-cleaning and offers reasonable check-out times. Thank you very much for taking the time to leave us your review Peter. We appreciate feedback and hope that you had some time to enjoy your stay in Whistler outside of business. We are aware of the towel rack and have maintenance scheduled in for this. Upon inspection the toilet was no longer running so the button must have just been stuck down. I understand that 10am may seem early for check out however this is agreed upon when you booked your accommodation. The 11am check out was given to you as a curtesy and we always try to accommodate early check in / late check out requests where at all possible. We do not expect pre-cleaning from guests however we expect properties to be left in a reasonable state which would include emptying your food from the fridge and taking out garbage. We would like to thank you for switching off lights and starting the dishwasher before your departure and hope that your meeting went well. The place was excellent and all the instructions were easy to folllow. Location is great. An easy 20 minute walk to the village. Easy access to local trails from the doorstep. Thank you for the wonderful review, we are thrilled to hear that you were able to enjoy every aspect of this unit. Looking forward to hosting you again soon! Awesome condo that is well layed out! Convenient shuttle to the village! Thank you for taking the time to leave us a review Leslie. We hope that you enjoyed your time with us here in Whistler.